In November 2006 my husband Jeremy and I had the privilege of visiting E. Africa with WeSeeHope (formerly HopeHIV) to see at first hand, some remarkable work being done to support orphans and vulnerable young people. 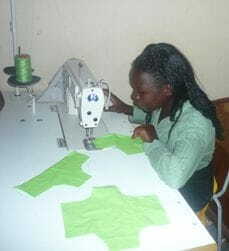 As a result, from the setting up of Curtains Made For You in 2009, we have supported Masaka School in Uganda, a school for orphans with hearing and speech impairments. In early 2013 we received the wonderful news that the pioneering work done by the School has been widely recognised and its future funding, consequently assured. delighted that from July 2013 we will be involved with, and supporting the Oasis Skills Training Project in Harare, Zimbabwe. The ongoing economic crisis in Zimbabwe results in many orphaned children dropping out of school and turning to the streets to beg for money. Once on the streets, girls are especially vulnerable to prostitution. WeSeeHope is working with Oasis Zimbabwe to reach these extremely vulnerable girls through pioneering the Skills Training Project in the Epworth community in Harare. We are so pleased to be associated with this work, giving you, our customers, the opportunity to play a part in providing a future for young people who otherwise would be without hope. Our involvement in Oasis Skills Training in Zimbabwe is made possible by the work of WeSeeHope, a UK based charity who support children and young people throughout sub-Saharan Africa affected by HIV/AIDS. Go to www.weseehope.org.uk for more inspiring stories!